I am now unsure why I was terrified of adding mineral salts to the water in the past. The core of the fear was based in confusion, and little bit of chemistry knowledge, and the utter frustration I was having previously in hitting a proper mash pH. As well, the information I got from my local water provider was just plain unbelievable. Rather than getting into the chemistry – which I will get wrong – lets just hit the high points. Mash pH is critical to ensure starch extraction and conversion to sugars by enzymes released by hydration of the grist. Very specific temperature ranges favor certain enzymes and requires an optimal 5.2-5.6 mash pH. Notice that the MASH not the WATER (liquor) pH is critical. It happens in the mash when the crushed grains are hydrated, and minerals in the grains and husks affect where the pH goes. Often, one may need to add liquid acids, or a base mineral such as pickling lime to achieve a reasonable pH. Have a good pH meter handy and take measurements right after dough in, and throughout the mash process. Cool the samples to room temperature before taking the readings, even with an ATC meter. A bowl in an ice bath can quickly chill out a small 2-3 ounce sample. Mineral salts however are used primarily for flavor, however have the further benefit of being acid or base and will influence mash pH. Burton on Trent is famous in the brewing world for extremely hard water with a very high mineral content, as an example. This water has helped to formulate the flavor profile of bitters and porters from that area. General rule of thumb: Sulfate favors bitterness and dryness, Chloride favors malty flavors and more body. Brewing liquor alkalinity is more important than its pH… get that water analyzed or use R/O! First, we plan. If I am going to make an IPA, I will target a very high level of sulfate and a lower ration of calcium chloride. If it is a maltier style – I might swap those around with a lower sulfate level. So the style drive the water additions, which makes sense, since many styles are “local” expressions of traditional water sources. With R/O water, we have an essentially clean slate to mimic those sources. The caveat here is that the information about those sources often fails to explain how the water is processed at the brewery and may not address seasonal changes – so research is even more important. If you are trying to make a clone – it may be necessary to brew test batches and adjust the additions to tweak that final profile. 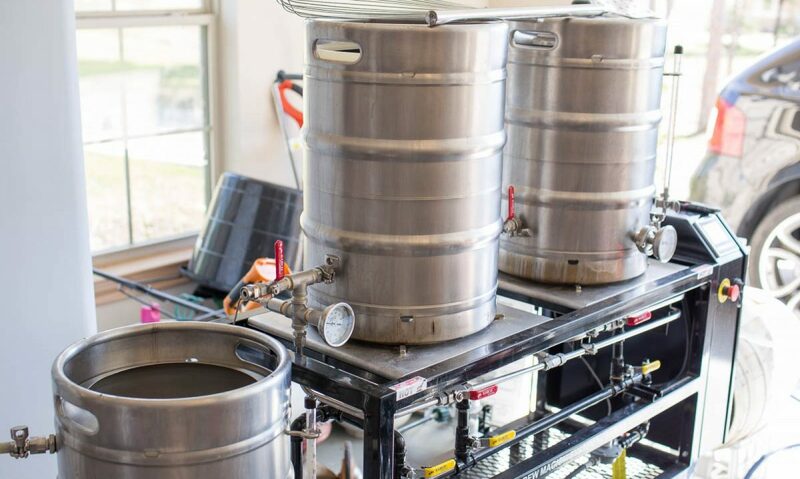 Bottom line – when brewing with R/O water, the mineral additions are critical elements of the recipe. With the release of Palmer and Kaminsky’s “Water, A Comprehensive Guide for Brewers” we should see some refresh to concepts such as residual alkalinity and chloride/sulfate ratios or brewing to regional water profiles. I have just started the book – so will not comment on such now, but reading with an open mind. Then, we track and observe the results. Here is the fun part for me… tasting. Martin and AJ, resident water experts at homebrewtalk.com often recommend adding minerals to finished beers and tasting. This is a fascinating way to directly see how certain salts and balances affect the flavor. I recently brewed a pretty flabby pale ale, and sat with it and added calibrated amounts of gypsum to bring up the bitterness level. It took a LOT more gypsum than I thought it would, which leads me to choose a much more aggressive bitter profile for my next pale ale. This also works with Epsom and Calcium Chloride, and will also affect the final pH of the beer. This helps to drive elements like bitterness, but also dryness, mouth feel and body. Keeping good records and frequent brewing will help you dial in the correct and preferred rates for your brewery, and defer from the recommended profiles based on your preference and experience. Since many of the mineral salts we need are acids, there is a benefit helping to drive the mash pH down (for light beers), but we often need only a portion of the additions to do so. This helps eliminate a need for liquid acids (lactic or phosphoric). It may also require alkaline additions, such as baking soda or pickling lime to raise the pH in the presence of acidic roast and crystal malts for darker beers. Finding this balance is where a spreadsheet simulation is extremely helpful. I use the “Bru’n Water” spreadsheet to help to model my mash pH, as well as keep a detailed record of my additions. This works wonderfully, and a tab allows me to cut/paste the additions into BeerSmith for record keeping. Each beer will get a dedicated spreadsheet and will be named appropriately… “WitorWitoutYou_brunwater.xls” so that it is easy to find. I even keep these on Google Docs or Dropbox to share across my devices so they are handy. I plan to do a walk through on how to use Bru’n water – although it is not all that complicated. If you like and use that spreadsheet, please donate. He will email you a more capable spreadsheet and upgrades – it is donation-ware, so not expensive, and supports Martin’s brewing focus work (not his day job). Careful measurement! I use a jeweler’s gram scale with a tolerance of +/- 0.001. Once I have my calculated additions for mash and sparge/boil, then I take the time before the busy brew day to very carefully weigh out each mineral addition. I like to use a folded piece of parchment paper and wrap up with a label and then into a zip lock baggy. Usually we are taking just a few grams of minerals total for a 10 gallon batch, so it is important to be accurate – for the sake of consistency. At these weights, a portion of a gram could throw off 20-30% of your measurement. Come brew day, when I start heating my strike and sparge water, it is easy to then grab my little packets and toss them in before dough in. I even dunk the parchment just to get the last few crumbs. A note: Martin recommended adding my additional salts to the sparge water rather than the boil kettle, rather than using acid to hit a sparge pH. I think this is more convenient, and just brewed with this process, so cannot comment on other than a convenience factor yet. It certainly should prevent the pH rising during sparge and risking tannin extraction. For dark beers, at the dosing rates we are talking about – we shouldn’t fear the lime or soda solution too much… just keep an eye on the Sodium levels. As mentioned, I will do a walk through tutorial of Bru’n water at a later date… so you can see the tool in application. There are other spreadsheets, and I suggest picking one and sticking with it – even comparing it to other spreadsheets. Hang out in “Brewing Science” at Homebrewtalk.com and you will learn quite a bit about water chemistry. At the end of the day – my conclusion is that I cannot brew without mineral additions, any more than I can cook without salt. They make or break my beers… and while I am still learning, the difference in just a few brews has been tremendous!